Info - HIND SIGHT INC.
Strands of the string obstructing your view. Decreased arrow speed due to drag. Strings stretching causing peep sights to move. Lost accuracy due to over sized peeps. Diminished target acquisition in low light. "Looking through a peep sight is like placing your eye behind a key hole to see what is on the other side of the door." "Taking aim with Hind Sight is like looking through a window." Hind Sight has taken the peep sight out of the string, moved it forward, and secured it to the riser of the bow. Our peep is created by a unique open center design in the shape of an X which allows all of your vertical pins to be seen and used. The space between the cross hairs is a very tiny .060" for pin point accuracy. 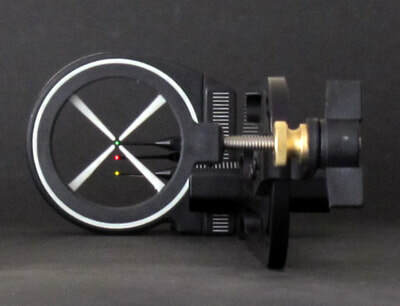 The open center cross hairs that glow in the dark were developed specifically to take aim while hunting under low light conditions. 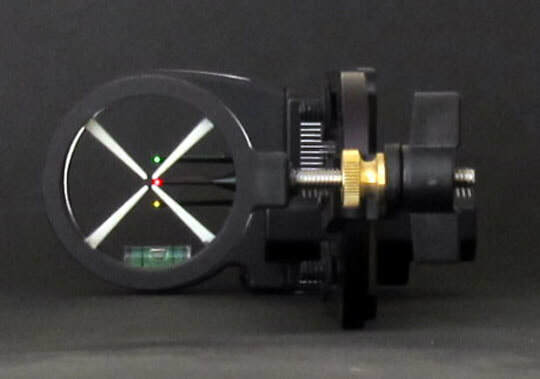 Because our sights are mounted to opposite sides of the riser, if you torque the bow, you will also torque yours sights. This simple feature provides instant feed back detected by your eye allowing you to make the correction before you release the arrow. 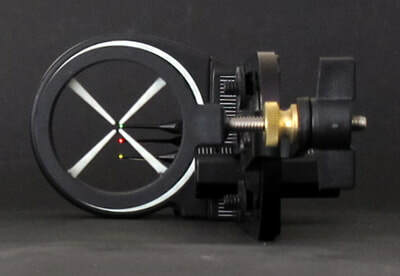 Most archers that use peep sights will start out with one that has a tiny aperture. The smaller the aperture is, the less room for error you have and the more accurate you become. Unfortunately this will diminish your ability to see your target under low light hunting conditions. The peep is so close to your eye that it restricts the amount of light that enters your eye. This will trick your brain into thinking that you are in the dark causing your pupils to dilate to let in available light. Because your mind will not allow your eyes to be poked by anything they cannot see, your eyes will only focus on objects close at hand. Remove the peep from in front of your eye, light reenters your pupil and presto, there’s your target. So, the quick fix is to increase the size of the peep by enlarging the aperture to let in more light. This will not resolve your ability to see your target in low light. The larger peep still restricts the amount of light that enters your eye. You have just compounded the problem. By increasing the size of the aperture, you reduce your level of accuracy because your front pin is now floating inside of a large circle. Some peeps have gotten so large to fix this low light issue, looking through one is like sticking your head inside of a truck tire to line up your sights. The patented peep sight forward design by Hind Sight has addressed both of these issues. 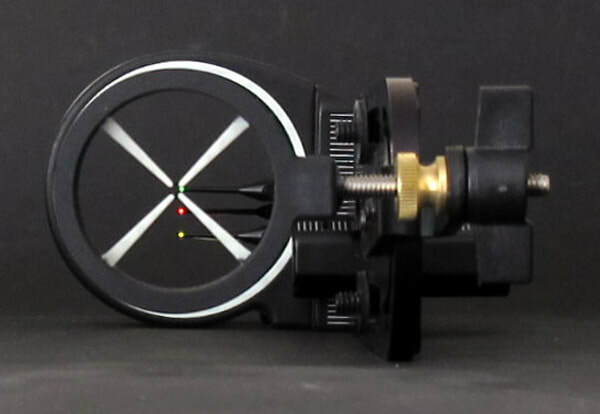 The aperture created by the open center cross hairs is a very tiny .060” for pin point accuracy. The cross hairs also glow in the dark and remain visible even in total darkness. Because the rear aperture is so far forward from your eye, it does not restrict light from entering your eyes. This allows archers to take aim under the dimmest of lighting conditions. Torque your bow and you also torque your sights. Hind Sight provides instant feed back detected by your eye. Bow strings were never intended to have secondary sights installed into them. Their sole purpose and design was to launch arrows. An arrow that travels at 250 feet per second, needs to be launched by a string that is traveling at 171 miles per hour. Once the arrow is released, the string continues to travel. Some strings will slam into string stops if the bows are so equipped. Others will travel beyond their relaxed position, stretching until they spring back, oscillating until they stop. This happens every time you launch an arrow. This constant pounding and stretching will cause your peep sight to become unreliable. All bow strings stretch. All bow strings twist. These are just a couple characteristics of string. A typical bow string made today will have sixteen separate strands designed to work as one. This is how the string gets its strength, team work. As soon as you split the string in two and insert a peep sight you have considerably diminished its strength and reduced its capacity to do the job that it was intended for. The peep sight is also exerting a tremendous amount of horizontal force on a vertical string that you have already weakened by half. It is no wonder that string peeps are in constant flux. Some archers have added rubber tubing attached to the riser and string to prevent the sting from twisting. This tubing creates a tremendous amount of drag diminishing arrow speed, can be very noisy when the arrow is released, and sometimes strikes the user in the face when it fails. Again, Hind Sight has found the solution to these common peep sight problems. By securely attaching your secondary sight to the riser instead of the string, all of these common peep sight problems vanish. No more drag created by jumbo peeps or rubber tubing. No tubing to fail. No lost accuracy due to an over sized peep. The string is free to stretch without taking your rear sight with it. The string will now work as intended, launching arrows as it was designed to do with less wear and tear and longer string life. And your rear sight, Hind Sight stays put securely attached to the riser. But the biggest advantage of all is the fact that Hind Sight can help you hold your bow straight. How it works, is why it works. By mounting both sights to opposite sides of the riser, your sights will now detect bow torque. Torque the bow and you torque your sights. This simple feature will train you to hold your bow straight, pointing your arrow at your target. Because the bow string is independent of the riser, it cannot and will not detect torque. This feature is critical when hunting. Sometimes you have to take the shot you are given in a matter of seconds, Hind Sight will ensure that you are in the correct alignment and proper hold to take that shot. 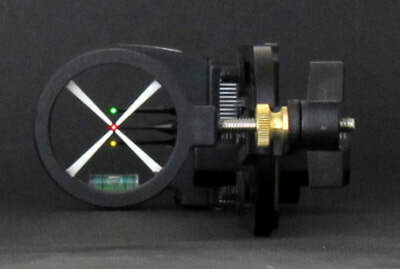 There is no other sighting system like the string peep, on any kind of weapon, where one or both sights move to take aim. Best Regards, Don Priebe / President - Hind Sight, Inc.
Trade Marks Of Hind Sight, Inc.